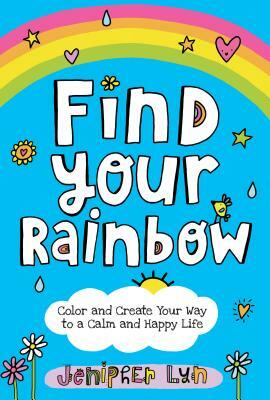 Find Your Rainbow: Color and Create Your Way to a Calm and Happy Life (Paperback) | Tampa's only full service INDEPENDENT bookstore. This colorful and engaging discovery guide and activity book encourages self-growth and creative expression as it helps girls through the sometimes tough journey of growing up. * Do you ever wish you could be more confident? * Or wonder how to make a new friend? * Do you ever want to try a new hobby? * Or imagine your dream job, even if it might seem strange--like a cat vet in space? Well, look no further! Life may not always be easy, but it's important to remember that the world needs someone just like you! By unlocking the secrets of your heart, you can learn to be more mindful and believe in yourself as you doodle, write, and dream your way to happiness--once you find your rainbow. Jenipher Lyn Gallardo is a professional artist whose clients include Design House Greetings, Women You Should Know, St. Jude Children's Research Hospital, and Girls on the Run. Her paper products have been featured in twenty-two stores, including Target and Trader Joe's. You can follow her on Facebook at NightlyDoodles and on Instagram at @jenipherlyn, or visit her at JenipherLyn.com.